Besides getting used to having all the additional hardware in your mouth, you’ll also need to change your diet to make it easier to clean your teeth. The wires, brackets, springs, screw, and bands are all more likely to catch food debris. This creates many more nooks and crannies for debris to collect and harbor bacteria, allowing thicker layers of plaque biofilm to form. Once these large colonies of bacteria form, they’re able to consume food debris more quickly and produce larger amounts of acid as a result. This is the main cause of the white, chalky, orthodontic spots that appear after braces are removed. However, these can be avoided if you’re taught how to clean your braces properly. Toothbrushes – A manual or electric toothbrush will work fine with braces. 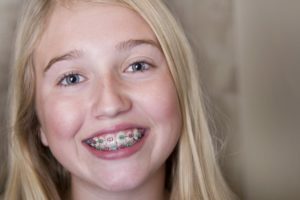 After you’ve removed any elastics you may be wearing with your braces, make sure to clean your braces at a 45-degree angle at the gum line, brushing back and forth and sweeping toward the biting surface of the teeth. To remove food debris from the brackets, hold your lip back with one hand and brush the top, bottom, and front of your brackets and wires. Floss and Interdental Cleaners – The best tool to remove food debris is floss threaders. While other floss tools are convenient when you’re away from your bathroom, floss threaders are specifically designed for orthodontics. Gently glide this floss along the surface of your teeth and gently clean the area below your gum line. Waterpicks – These devices are ideal for flushing out food debris, biofilm, and bacteria from hard-to-reach spaces. While they should never replace brushing and flossing, it can make these steps easier. Fluoride Treatments – According to the ADA, fluoride mouthwash can decrease the risk of tooth decay while wearing braces. Look for germ-killing rinses and anti-bacterial toothpaste to decrease the concentration of bacteria living in the mouth. By keeping these treatments in mind, you can expect a white smile as well as a straighter one after your braces in Newbury Park come off. If you’re considering braces for your orthodontic treatment, schedule an appointment with your dentist today! Dr. Gary Chaffee earned his dental degree from Loma Linda University School of Dentistry. He then completed a two-year Progressive Orthodontics program and eventually became an instructor for Progressive Orthodontics. He’s taught the course for more than 10 years in several countries around the world. To learn more about his orthodontic treatments and practice, contact him at (805) 480-0033 or visit his website.